A young man had just graduated from high school in a very small town. Home to him was very boring. He was tired of his parents telling him what to do, tired of having to do chores, tired of not being able to do what he wanted, when he wanted, the way he wanted. He wanted freedom. He knew that his dad, who owned a small car repair shop in town, had been saving up money for him to go to college. No one in his family had ever gone to college before. It was his dad’s dream to send his son off to college, and he’d been tucking money away for years. The son went to his dad and said, “Dad, I know you’ve been saving up money for me to go to college, but I want to take a break from studying to see the world. If you give me the money that you’ve been saving for my education, I can travel around, earning money as I go, and then I’ll go to college in a year. The Dad gave him the money. The son didn’t get very far. He made it as far as the nearest city where he rented an apartment in a nice condominium complex with a few of his high school friends. He had a blast. He bought a sweet car, went to clubs, took lots of women home. But after awhile, his lifestyle began to spin out of control. He got caught driving under the influence, lost his license. His drug use intensified. He began paying for his women. Eventually, the money ran out and his friends gave him the boot. He had no employment experience, so in the end, he got a job at McDonald’s flipping burgers, sleeping on a friend’s floor. His life felt sour and stale. This summer, we are talking about the fruits that we, as a fellowship, will bear as we open ourselves up to the heart of God. We can only give what we have first received. The fruit that grows in us is always the fruit that we have first been fed. God has been feeding us the fruit of welcome. God is whispering to this homesick world, “Come to me. All who are thirsty, all who are hungry, come to me. I am the home for which you long. I am the life you seek. Even if you do not know my name, you have been searching for me, hungrily, your whole life. I am who I am. Come to me.” We have taken that step towards him, and he takes us in his arms and holds us, whispering in our ear, “Welcome home”. We, the fellowship, have heard this invitation and have been welcomed home, in all our messy glory. In our emptiness, our aloneness, our fragmented, messy lives, we have encountered the welcome of God. Every week, when we gather together, we experience a mini-homecoming. “Come to my table. Have my wine, eat my bread, you are welcome in this place.” We experience the deep hospitality of God, and God’s arms embrace us once again. This very welcome is the fruit that God desires we bear into the world. The Spirit in us wants to help us bear the heartbeat of the Father. When we see the broken young man, or the awkward stranger, or our frazzled neighbor, the Spirit in us rushes up, urging us to respond — stop what you are doing. Get up! Go out to meet them! Scootch on over! Make more room! The more the merrier — let them in! When we do, when we open up our hearts, our lives and let them. 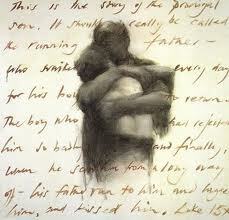 We become the arms of the Father, because the arms of the father are already in us, and around us.